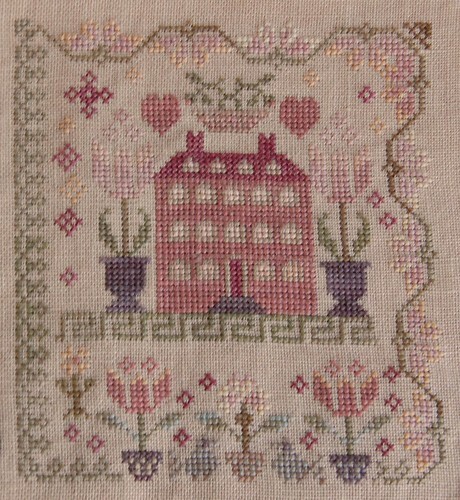 Nicole's Needlework: Pink Hill Manor Finished! Well, it's almost finished. I haven't done the personalization yet. 40 ct. Meadow Rue by Lakeside Linens, Various cotton threads (1 over 2). I also have a tiny bit more progress on Hannah Pepper to Share. 40 ct. Vintage Light Examplar, NPI (1 over 2). I had couple people ask where to find this pattern. It is in three issues of Fine Lines Magazine - Summer 2002, Fall 2002 and Winter 2003. I found a couple of the them on eBay. Write soon! Pink Hill Manor is just beautiful - all my favorite colors. The whole thing together is really something! Good progress on Hannah, too! very very pretty! you're doing great. hannah is nice...I like the bolder colors on that one. My favorite one of them all on AoTH! My fave color is pink and Jakey Brown is beautiful! All that lovely pinkness! It looks wonderful! Pink Hill Manor is so pretty, the whole finish is going to be stunning! Both are lovely projects! Great stitching, Nicole. Nicole ~ it is coming along beautifully! Beautiful! I love both pieces! Looking great Nicole! Your needle is flying! Love this one!! Nice start on Hannah! AotH is looking fantastic! How pretty is Pink Hill Manor with all those lovely colors? And then the yummy bolds of Hannah, what fun to stitch. Beautiful! I think this is one of my favorite blocks. Love Pink Hill Manor! I love all the colors pink. Anyho, your progress is great. Looking great! you are a stitching dynamo! Yay! Gorgeous finish - love the colors. Pink Hill Manor looks lovely and the whole thing looks spectacular! 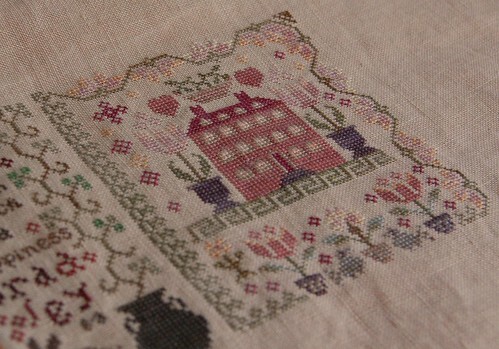 I always feel like stitching something pink or red around this time of the year, so "Pink Hill Manor" would be a perfect choice. Love the colors! Oh my goodness! Pink Hill Manor is superb!!! Wonderful progress on both samplers, Nicole! Your AotH looks fantastic. 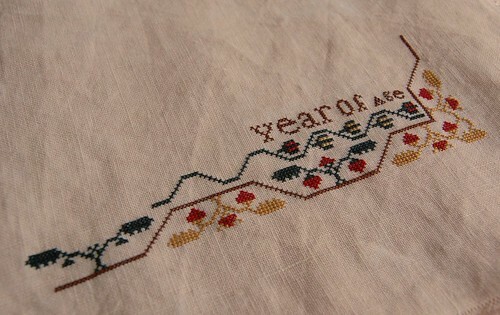 So beautiful Nicole - this sampler is going to be wonderful when finished. What a sweet finish! I love the way your AotH are turning out! Nicole, Pink Hill is very beautiful! Gorgeous! I can't wait till I get to that one. And your Hannah is looking lovely too - love the colors. Love your AotH, isnt' it fun and pretty start on Hannah Pepper.